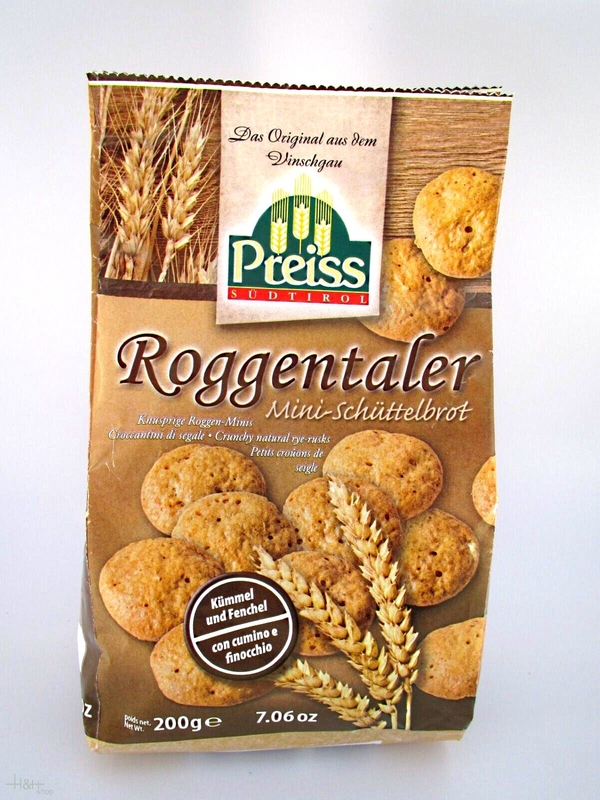 We offer you here a packet Vinschgauer rye talers 200 gr., a new speciality made after old Vinschgauer recipe the bakery Preiss Kastelbell. The Rye Talers are crunchy mini crisp breads. Ingredients: Rye flour, soft wheat flour, water, sea salt, yeast and caraway. Made without colorings and preservatives, a real natural product! Taste: Purely decently, crisply and of course, suitably also as a base to all what you may, in particular to bacon, salami, smoked sausages, ham and cheese, however, there are set no limits are here. To a good South Tyrolean "Marende" the crisp bread of course may not be missing. The bread similar to round flat dough-cake received his name by his original production procedure which is still exercised: The dough of rye flour, water, yeast, salt and spices is shaken with the hand level and is baked afterwards crisply. Uncomplicated storage, long durability and of course his natural ingredients make the "Schüttelbrot" a little bit particular. ready for shipment: in stock Schüttelbrot Knabbermäuschen Trenker 200 gr.